Bring the best of Canada to your table with these recipes and cookbooks from top Canadian chefs. Yes, there is such a thing as True North Culinary Cool, but Canadian chefs don’t always have it easy. Canadian cuisine is an enigma. Its definition is a bit of moving target: Moose burgers and beer? Ice wine and butter tarts? Sockeye salmon and rye whisky? And, although we’re not complaining because each is delicious in its own way, we’ve evolved beyond these iconic Canuck eats. Now we’re embracing our great white weather, the changing of the seasons and the challenges they present to what we eat, when. From farm to table, locavorism and molecular gastronomy to top chefs lauded around the globe, we’ve got it all, but the bill of fare is a sum of its parts. So, with that in mind, allow us to present a shortlist of cookbooks, with a recipe from each selected for you, dear reader (including this delicious take on our multicultural Canadian heritage, Butternut Squash Apple Aloo Gobi, above, from Real Food, Real Good, by PEI super chef Michael Smith) dedicated to true north food that will also make perfect holiday presents for your resident chef. 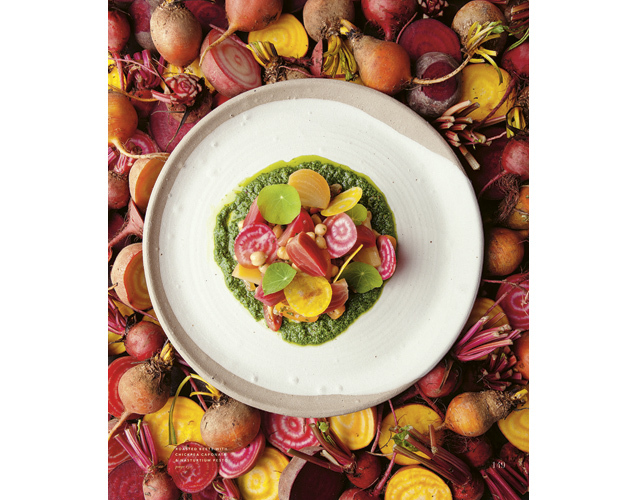 Scroll through for more of Michael Smith’s recipes, as well as recipes from Araxi’s chef James Walt in Whistler, B.C., a vegan recipe for French Toast from Padmanadi restaurant in Edmonton, and a twist on risotto from Beckta’s chef, Katie Brown Ardington, in Ottawa. Enjoy! 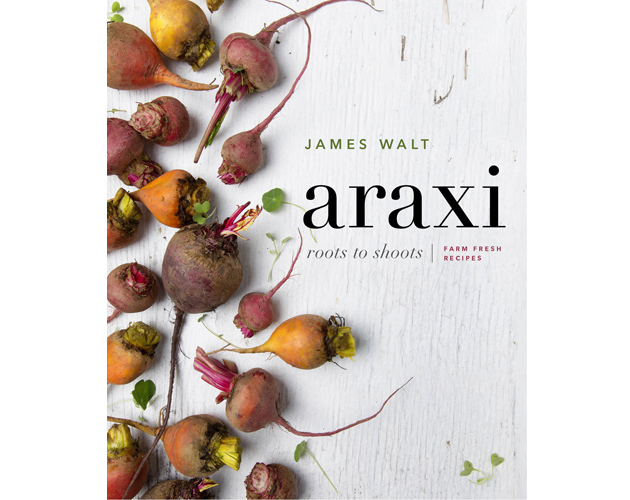 Araxi: Roots to Shoots, Farm Fresh Recipes by James Walt. The sophomore outing from award-winning chef Walt and his kitchen crew follows his James Beard Award-nominated cookbook, Araxi. Both named for his Whistler, B.C., restaurant and oyster bar, this new offering features 80 dining room favourites, adapted for the home cook. Being B.C., it favours fish and seafood as well as the province’s longer growing season to include root veggies and orchard fruits and a few well-placed Asian touches. This recipe uses Nasturtiums, an edible flower. For more on edible flowers, see Lisa Bendall’s story, What You Need to Know About Edible Flowers. Preheat the oven to 375°F. Cut 2 pieces of aluminum foil, each 10 × 12 inches, and place one on top of the other. Place the beets in the centre of the foil and add the oil, thyme, garlic and salt. Fold the foil around the beets and roll up the edges to create a sealed package. Set the beets on a baking tray and roast for 30 to 40 minutes. To check for doneness, remove the beets from the oven, carefully unwrap them and insert the tip of a knife into one of them. The knife should slide easily in and out. When the beets are cooked, remove them from the oven, unwrap and discard the foil and set aside the beets until they are just cool enough to handle. Using your fingers or a dishtowel, rub the beets to loosen their skins. Peel and discard the skins. Set aside to cool. Have ready a large bowl of ice water. Bring a large saucepan of salted water to a boil on high heat. Add the nasturtium leaves and cook for 20 seconds. Using a slotted spoon, transfer the nasturtium leaves to the ice water to stop the cooking. When the leaves are cool, drain them and pat them with paper towels to remove any excess moisture. Place the nasturtium leaves, grapeseed (or canola) oil and garlic in a blender or food processor and blend at high speed for 1 minute until smooth. With the motor turned off, add the cheese, nuts and lemon zest then process at high speed for a further 30 seconds until thickened. Pour into a bowl and refrigerate until needed. This will keep refrigerated in an airtight container for 2 or 3 days. Our non-traditional take on a caponata uses chickpeas instead of eggplant but retains all the sweet and sour flavour. Nasturtiums are fantastic, and I always love the look on people’s faces when they first eat one of these flowers. Where do you find them? Look no farther than your neighbour’s garden or the farmers’ market. While you’re there, pick up some beets: we like ours somewhere between the size of a golf ball and a pool ball so they roast evenly. Heat the olive oil in a medium saucepan on medium heat. Add the red onion, garlic, bay leaves, coriander and chili flakes and cook for 4 to 5 minutes, until the onion has softened and the garlic is fragrant. Stir in the chickpeas, tomatoes and raisins and cook for 3 minutes to let the flavours combine. Remove from the heat and refrigerate until cool. Stir in the olives and parsley. To serve Place 1 Tbsp of the nasturtium pesto in the centre of each plate. Spread it across the plate with the back of the spoon. Top with 3 or 4 Tbsp of the chickpea caponata. Cut the beets into slices or quarters and arrange them on top of the chickpeas. Drizzle with the remaining pesto and garnish with nasturtium leaves. After the success of Amy Rosen’s Toronto Cooks: 100 Signature Recipes from the City’s Best Restaurants in 2014 (go to everythingzoomer.com/toronto-cooking), a few equally enthusiastic food writers couldn’t resist following suit. 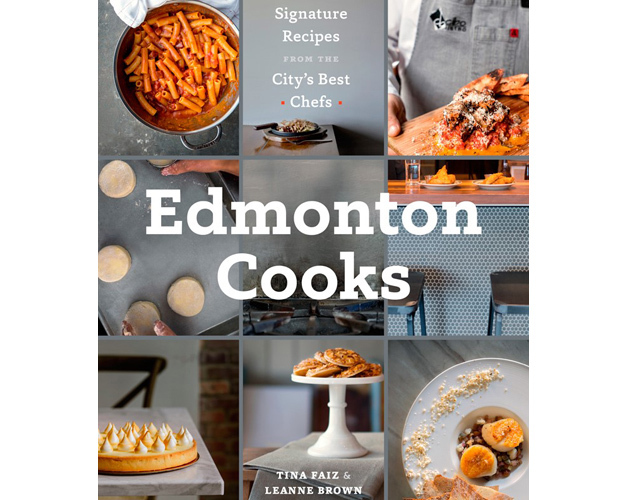 Edmonton Cooks: Signature Recipes from the City’s Best Chefs by Tina Faiz and Leanne Brown; and Ottawa Cooks: Signature Recipes from the Finest Chefs of Canada’s Capital Region by Anne DesBrisay (following page). Both feature top chefs in the their respective cities, enriched by our country strong multi-cultural heritage, along with prep tips and a few cocktail recipes. Cheers. Since Padmanadi is a vegan restaurant, they use margarine and vegan sour cream (easily bought in most grocery stores) in this recipe. Of course, you can substitute butter and regular sour cream if you choose. In a bowl, gently mash bananas with a fork. Add coconut milk, cinnamon, brown sugar, and nutmeg, and whisk to combine. Place slices of bread in a casserole dish. Pour the coconut-banana mixture overtop. If your dish is not large enough, soak in batches. Allow the bread to soak for 3 to 5 minutes. In the meantime, whisk together sour cream, icing sugar, and lemon juice in a small bowl to create a vegan crème fraîche. Set aside. Heat margarine in a large frying pan on medium. Add soaked bread slices to the pan (one or more, depending on the size of the pan) and cook for 1 to 2 minutes, until golden brown. Flip and cook the other side until golden. Repeat until you have grilled all your French toast. 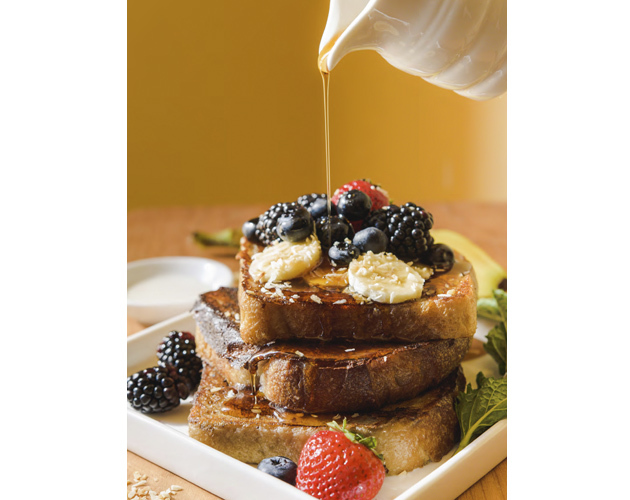 Serve 3 slices of French toast per person with a healthy dollop of crème fraîche on the side. Dust with icing sugar and sprinkle with toasted coconut. Arrange fruit on the plate and serve. 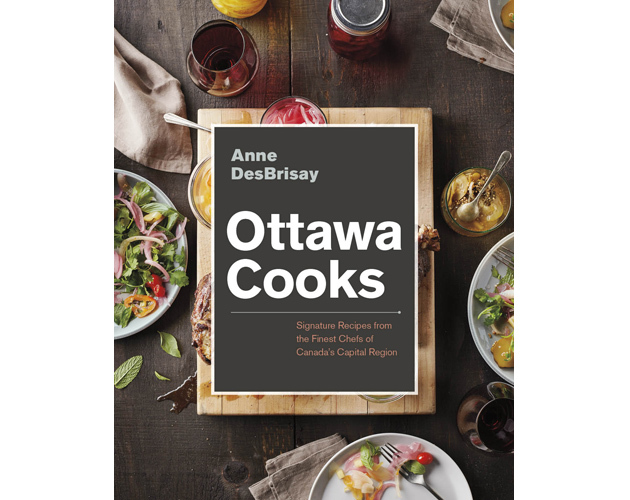 Chef [Katie Brown Ardington] says: This dish [from Ottawa Cooks: Signature Recipes from the Finest Chefs of Canada’s Capital Region by Anne DesBrisay] offers everything I love to eat. It is hearty but fresh, with lots of herbs and citrus. Plus I like anything with a poached egg and sharp cheese! It is perfect for a light main with some bread and salad on the side, or make a smaller portion for an appetizer. I have made many versions of this dish with leftover risotto for family meals at [the restaurant] Beckta. In a large pot, bring stock to a boil. Season with salt and pepper to taste. Turn down the heat to keep the stock at a steady simmer. In a large saucepan over medium heat, melt 3 Tbsp of the butter. Add shallots and sweat without colouring for 4 minutes. Stir in garlic and cook for 1 minute. Add rice and cook, stirring, until rice turns translucent and has a nice nutty aroma, about 3 minutes. Pour in wine and cook, still stirring, until absorbed, about 3 minutes. Add hot stock, a couple of ladlefuls at a time, and cook, stirring, until absorbed. Repeat until stock is used up, rice is slightly firm to the bite and all the liquid absorbed, 20 to 25 minutes. Remove risotto from the heat and set aside. In a large saucepan over medium heat, melt remaining butter. Add watercress, lemon juice (reserving zest for later), parsley and mint. Cook until watercress is just wilted. Pour in remaining stock and cook for 1 minute. Transfer watercress mixture to a food processor fitted with the metal blade and process until watercress and herbs are finely chopped. Stir the purée into the risotto (the consistency should be nice and runny). Stir in half the Parmesan and lemon zest, salt and pepper to taste. Have ready a large bowl of cool water. Bring a large saucepan of water to a boil. Add vinegar and turn down the heat to a simmer. Stirring the water with a fork to create a whirlpool, break eggs into the simmering water, 3 at a time. Once they rise to the surface, trim any wispy tails of white with a slotted spoon. Poach eggs for a total of 4 minutes. Using the slotted spoon, carefully transfer eggs to the bowl of cool water. Poach remaining eggs and transfer to the cool water. Warm six individual soup bowls in the oven. Gently rewarm the eggs in a large pan of simmering water for 1 minute. 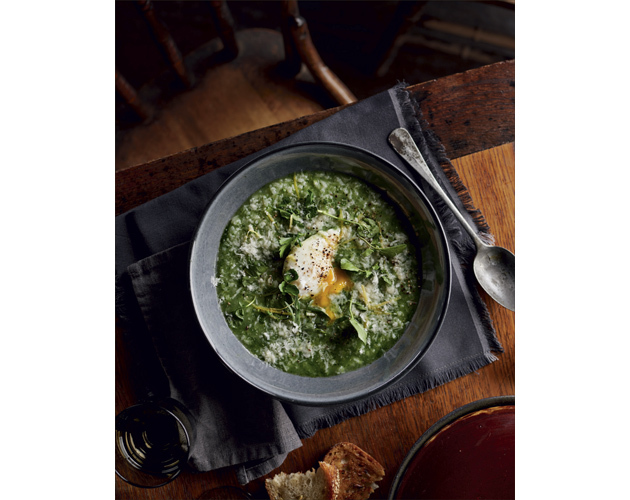 Ladle risotto soup into the warm bowls, place a poached egg in the centre of each bowl and sprinkle with remaining Parmesan. Garnish with more herbs, if desired. 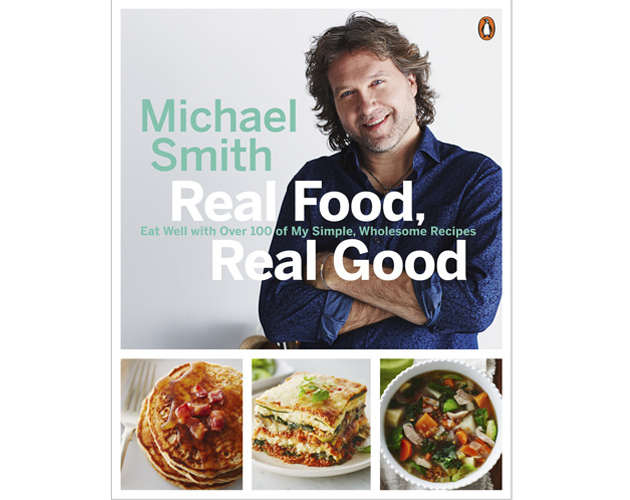 Real Food, Real Good: Eat Well with Over 100 of My Simple, Wholesome Recipes by Michael Smith. Canada’s poster boy for Down East hospitality, the P.E.I. native, chef, cookbook author and Food Network star takes a healthy approach to every day cooking. Smith tosses together zucchini and chia into a lasagne, adds lentils to meat loaf and ancient grains to granola, to name just a few health-meet-homey collaborations. Preheat your oven to 375°F (190°C). Turn on your convection fan if you have one. Melt the butter in a small pan over medium heat. Add the garlic, jalapeños, cumin seeds, fennel seeds and coriander seeds. Stir for a minute or two, until the spices are lightly toasted. Remove from the heat and stir in the curry powder, ginger and salt. 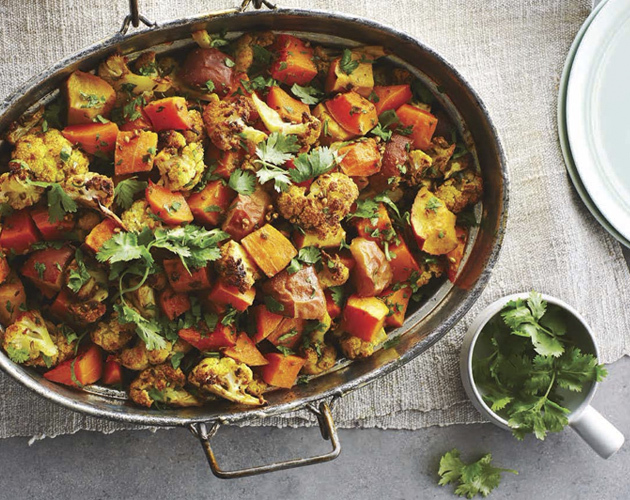 In a large bowl, combine the butternut squash, cauliflower and apples. Add the spice mixture and toss together until everything is evenly combined. Transfer the works to a 13- x 9-inch (3 L) baking or roasting pan, spread it into an even layer and roast until the vegetables are tender and lightly browned, about 1 hour. Just before serving, stir in and top with the chopped cilantro. Excerpted from Real Food, Real Good by Michael Smith. Copyright © Michael Smith, 2016. Food photography by Ryan Szulc. Published by Penguin, an imprint of Penguin Canada Books Inc., a division of Penguin Random House Canada Limited. All rights reserved. Click through to the next page for chef Smith’s yummy take on the Canadian classic, macaroni and cheese. Few things in the kitchen are as delicious to eat or as simple to make as a bubbling pan of mac ‘n’ cheese. That’s why I love trying different variations of the classic dish. 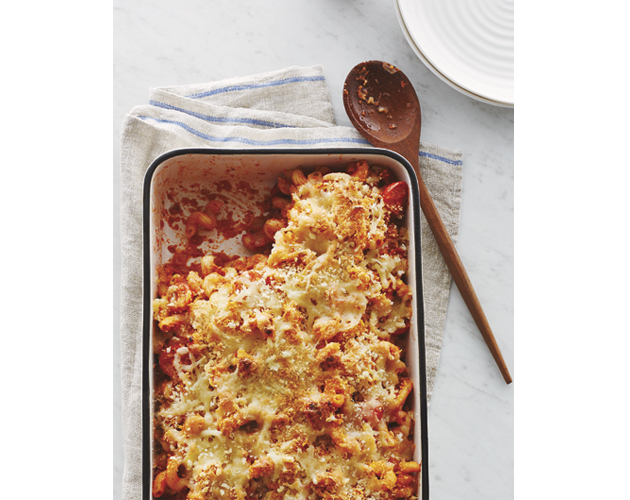 In this version, tomatoes and oregano add lots of familiar flavour. Whatever version you make, though, nothing beats the satisfaction of doing it yourself! Preheat your oven to 375°F (190°C). Turn on your convection fan if you have one. Lightly oil a 13- x 9-inch (3 L) casserole or baking dish with cooking spray. First, make the sauce. Splash the oil into a large pot over medium-high heat. Add the onions and garlic and sauté until fragrant, 3 or 4 minutes. Stir in the crushed tomatoes, tomato paste, cream, oregano and hot sauce. Bring to a simmer, then reduce the heat. Whisk in the Grana Padano a handful at a time. Meanwhile, bring a large pot of salted water to a furious boil. Toss in the penne, stir one or twice, and cook until the pasta is al dente, tender but slightly chewy, 10 minutes or so. Scoop out about 1/2 cup (125 mL) of the cooking water, then drain the pasta. Return the pasta to the pot along with the reserved cooking water, the sauce and the cherry tomatoes. Stir together well. Transfer to the prepared baking dish, spreading the works into a thick, even layer. Stir together the mozzarella and panko and sprinkle evenly over the pasta. Bake until bubbling hot, golden brown and crisp, about 20 minutes. For top Canadian chefs’ recipes, we share some of author Amy Rosen’s Toronto Cooks: 100 Signature Recipes from the City’s Best Restaurants picks (go to everythingzoomer.com/toronto-cooking).